Independent, integrated mobile software for facilities, asset and maintenance management. Extend the mobile capabilities of your current IWMS or CAFM system and redefine your mobile workforce strategy. Mobiess provides mobile-focused, independent workforce management solutions to organisations that want to enhance their mobile processes and efficiency. 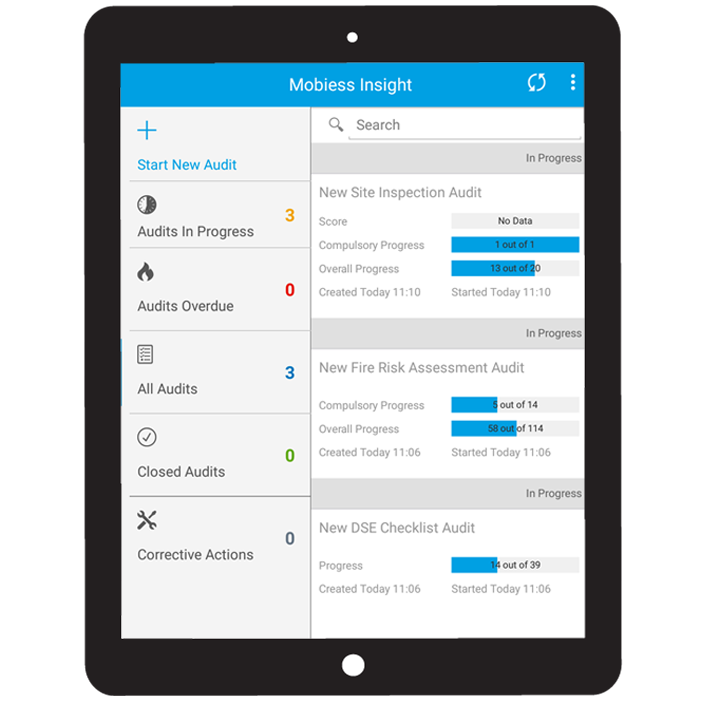 Our mobile platform gives you all the tools needed to track and report on your field workforce; from simple auditing forms and timesheets to more complex work order, service and asset/assembly management. Commercial off-the-shelf software often includes inflexible mobile functionality that lacks precision, and maps poorly to operational processes in the field. Introducing an independent, fully integrated mobile solution to your existing IWMS or CAFM system improves your field services with automated paperless workflows and faster access to critical information. For more information on Mobiess and our products download our Company brochure. Track task activities, timesheet information and status updates with your field workforce. Simplify data collection by converting your paper documents and sheets to enhanced mobile forms. Improve your M&E asset verification and fabric condition survey processes with our multi-project, multi-site mobile app. Log and track employee time, expenses and mileage via a browser, phone or tablet anytime and anywhere. Reduce the time it takes to complete stock audits and simplify stock counts with our offline mobile app. Collect real-time employee data for timesheets, absence and more through a hosted IVR platform using only telephone. Increase efficiency of your FM asset, building surveys and asset inspections. Automate processes and improve FM health and safety compliance. Add true field integration to your existing custom or legacy systems with our best of breed independent mobile solution. Support your strategy with consultancy services including custom reporting, data integration and configuration. Ensure the success of your project with a range of services including classrooms, team coaching and one-to-one sessions. “The Mobiess platform has enabled H & J Martin Limited to become one of the first truly paperless organisation in Northern Ireland. We now run all of our service sheets, expenses, auditing and asset surveys through the mobiess solution.